Pocahontas State Park is a state park located in Chesterfield, Virginia, United States, not far from the state capitol of Richmond. 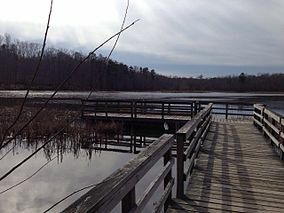 The park was laid out by the Civilian Conservation Corps along the Swift Creek, and at 7,950 acres (32.2 km2) was, at its creation, Virginia's largest state park. The park is named after Chief Powhatan's daughter Pocahontas. The park is the site of the Civilian Conservation Corps Museum with exhibits about the work of the Civilian Conservation Corps in Virginia. Located in a building constructed by the CCC, the museum's exhibits include photographs, artifacts and personal mementos. There are many miles of mountain biking singletrack available at Pocahontas for a variety of skill levels. These narrow trails feature log hops, tight turns, water crossings, and rock gardens. The park uses a ski style grading system to mark the singletrack, that is different from other trails in the park. There are 3 distinct trail systems in the park, Morgan trail system, Lakeview trail system, and the newest system, Swift Creek trail system. These trails are maintained in large part by a 501c3 volunteer organization, the Friends of Pocahontas aka FOPSP. A number of races occur annually in the park. In addition to the single track, there are miles and miles of multi-use fire roads around the park. A number of fairly well-marked routes exist for visitors to follow. ^ "Pocahontas State Park: Other info". Virginia Department of Conservation and Recreation. Retrieved 27 March 2017. ^ "Civilian Conservation Corps Museum". Virginia Department of Conservation and Recreation. Retrieved 27 March 2017. Wikimedia Commons has media related to Pocahontas State Park. This article about a property in Virginia on the National Register of Historic Places is a stub. You can help Wikipedia by expanding it. This page was last edited on 3 October 2018, at 21:13 (UTC).